Intraoperative brain monitoring during surgery at risk of neurological damage has become a common tool to minimize neurological morbidity and would be beneficial both for the clinicians and in particular for the patients. Currently, multimodal approaches are available for intraoperative monitoring of brain hemodynamics, oxygenation, metabolism, and function. The use of brain monitoring allows the anesthesiologist and surgeon to intervene before irreversible damage occurs. Since a single monitoring cannot detect all instances of cerebral compromise, simultaneous implementation of multiple variables enhances detection of critical situations and provides its responses to therapeutic interventions. 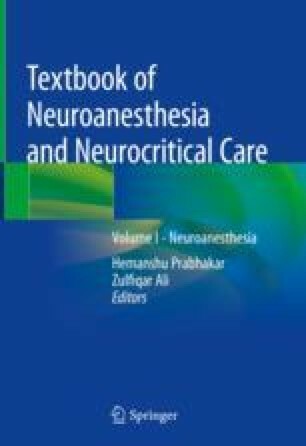 This chapter will provide an overview and recent evidence of brain monitoring applicable to intraoperative and critical care management of patients with neurologic disease, focusing on intracranial pressure, transcranial Doppler, near-infrared spectroscopy, electroencephalography, and evoked potentials (somatosensory evoked potential, myogenic motor evoked potential, auditory brain stem response, and visual evoked potential). In addition, we discuss the interaction between the anesthetic agents and the specific brain monitoring modalities to be monitored.